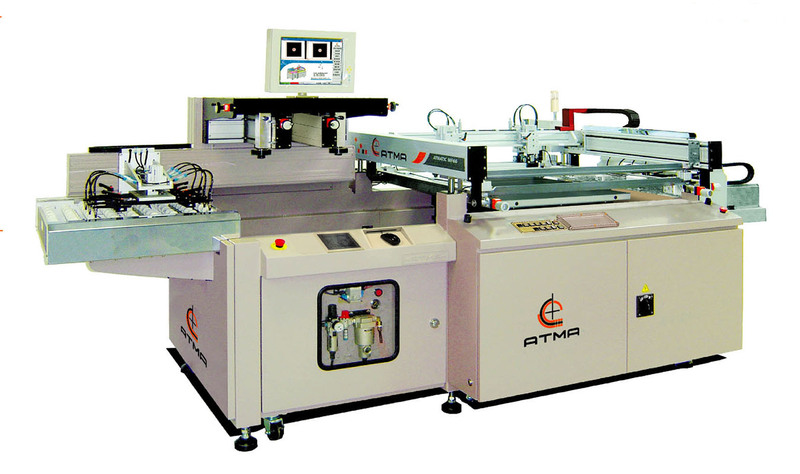 Precision fully automatic screen printing machine to meet highest demands, with 4-post system, CCD-camera system, movable print table with automatic inlet and outlet take-off device to produce high-quality prints on flat rigid materials such as glass panel, touch panels, LGP panels, PCB/FPC, HDI, and much more. The material is picked up with automatic inlet device and positioned on print table. After detection by the CCD camera the material is positioned with the highest precision. The print table moves into the print station, then the print process starts automatically. The material is removed from print table with an automatic outlet device onto delivery transport conveyor to drying/curing system. NOTE: Standard workflow is left in and right out. Latest G7 version four-post high precision screen printer integrated with lateral sliding table and CCD auto-registering system for precise registration and high productivity. State of the art structure is solid and light-weight, with top class drives (6 sets of servos plus AC motor) and precise guidance and positioning systems for fast, quiet, and smooth operation. Digital control panel can hold 100 presets to greatly reduce setup time and increase production capacity. Advanced PLC + IPC integrated control with color touchscreen display provides versatile function settings and instant operation/monitoring. Automatic error diagnosis system, safety barrier sensors, emergency stop button, warning lamp and more. Dripless squeegee, customized jig, retractable registration pins, automatic input/output, and more. Table size 750mm x 750mm 29½" x 29½"
Vacuum area 600mm x 600mm 23⅝" x 23 ⅝"
Max printing area 600mm x 600mm 23⅝" x 23 ⅝"
Min printing area 300mm x 300mm 11¾" x 11¾"
Substrate thickness 0.05mm - 6.0mm 0.00197"~0.236"
CCD Capturing Range (work center) X=132.5mm~305mm, Y=+270mm~305mm X=±5¼"~12", Y=+10⅝"~-12"
CCD field of view (ring 20mm) 10mm x 8mm 0.39"~0.31"
Min screen frame O/D size 900mm x 900mm 35½" x 35½"
Screen cleaning level 340mm 13⅜"
Table height 920mm+60mm 36¼" + 2⅜"
Machine dimension 370cm x 170cm x 180cm 146" x 67" x 71"
Note: Rough conversion made from metric scale to United States customary units. Change may be made without prior notice.